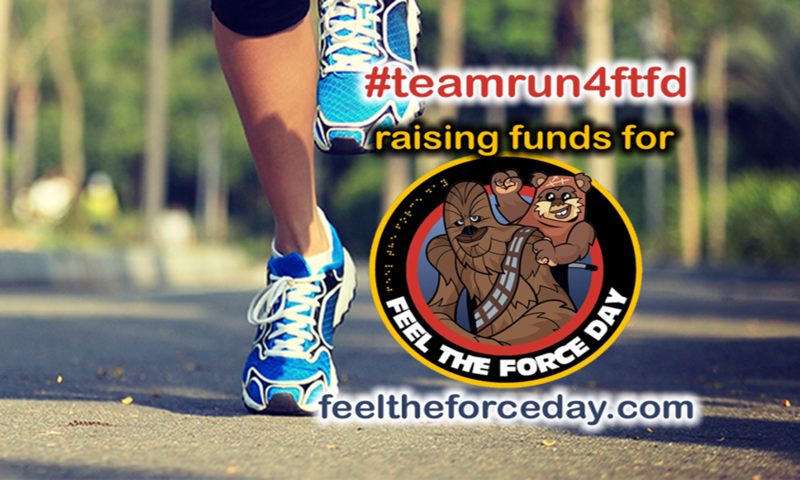 Hello – Sharon James here from the Run 4 Feel the Force Day team .. 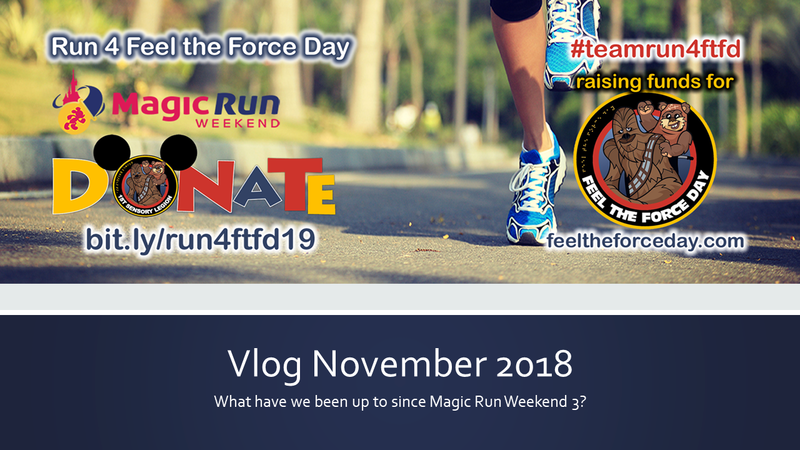 Welcome to the first in what we are hoping to be a regular (ish) vlog/podcast series for Run for Feel the Force Day. This is just a quick update on what has occurred since the Magic Run Weekend back in September. Firstly the team would like to thank everyone that sponsored us and for all the kind words and support for this year. Magic Run Weekend 3 was a little difference than the previous years the team had been, as Ben and I took part in the 36k challenge. This involved us doing the 5k at 8pm on Friday night, the 10k at 7am on Saturday morning and finally (ha) the half marathon (which is 21k) at 7am on Sunday morning – and it was tough. Sam and James also did the 5k and the 10k, so the first 2 races were a real team effort. Ben and I sang and danced our way around a very damp, chilly 21k on Sunday and it was an amazing experience. Between Sam being incredibly proud of what we all achieved and the fact we hit our £1,000 target – Sam was left in tears and speechless twice in 1 day, which is impressive ? So after our epic run weekend – we had a few days to recover and then we packed up and headed off to Peterborough for Feel the Force Day 6. Si and JJ made space so that the Run 4 Feel the Force Day team could have a display table, where we proudly had on show medals from the past 3 years of race weekends, all of the t-shirts and other memorabilia we had acquired. Sam had whipped up a presentation book of the story so far with photos, bibs, maps, etc and info about the race weekend and all the fun it actually is. Whilst at Feel the Force day we met the awesome Gary Callier ( from the Acorn Group), an incredibly talented local (to Peterborough) artist and businessman who has joined the team. Gary is ex forces so if he can’t whip us all into shape there is no hope for us! Gary is pencilled in to run the challenge with us for Magic Run Weekend 4 and has kindly offered to assist us with our logo and design requirements. He has already mocked up some ideas (which you can see here – for our visually impaired listeners, we have 2 designs, keeping the round feel the force day logo theme and style – 1 has stitch and a pirate, the other has mickey mouse, Donald duck and goofy running past the Disney castle), they are still work in progress but hopefully we will get a final design ready for the start of next year. Our plans are to use the logo everywhere, so that is associated with us as a team raising funds for feel the force day. We are also planning to get t-shirts and hoodies for the team and to also make some badges and other small useful merch that we can sell and all the proceeds will go into the run 4 feel the force day sponsor pot for 2019. We had such a great time with the table at Feel the Force Day that we would love to get it to as many comic cons / events as possible in 2019. If you know anyone that would kindly allow us to display the medals and have a small space for a tombola for Feel the Force Day please pass on our details or contact us via FB or our Website. As well as Gary, we have another new team member – the lovely Amanda Martin. This will be her first Disney run weekend – let’s hope that she knows what she has let herself in for ? Packages from Disney can be booked now with Bibs/Races included. We are expecting the first phase of bibs to be released about Easter time.. the bib only release is always a moving goal with run Disney France – so Sam stalks all the social media and reliable sources to get the info as soon as its made public. When we know, you will know if you are thinking of joining us. So we have a potential team of 6 so far – 5 of which will be running the 36k challenge. We are hoping the bigger team means more publicity and awareness raised and more money can be raised for Feel the Force Day. With a bigger team and now we are ‘Old hands’ at this running lark, the plan is to be a bit more organised and professional (a term which I am using very loosely). We are looking to have some kind of “uniform” or team gear – which is basically a t-shirt and hoodie for before and after the runs, wearing at events and for those of us that don’t want to run in costume. It is early days yet, but we are hoping to use some of Gary’s designs and have the website address etc. Plans are a-foot to find a printer that can make us some good quality cost effective run wear – if you can recommend anyone we would love to hear from you. Our aim for 2019 is to smash the £1,000 target. With a bigger team and more publicity we have optimistically raised our target to £1,500 – this will include money raised at events in costume with Stich, Ben the Pirate and friends, from the tombola and any merch sales – theoretically we should smash this target too , but we all know times are hard – and literally every penny counts so no matter how big or small – all donations and sponsorship amounts are greatly received with thanks. Training proper is going to start after (or during) the Christmas break, giving us plenty of time for some real training this year. To be honest we haven’t made much of an effort in previous years, but that 36k challenge is a beast and we would like to enjoy it even more next time around.